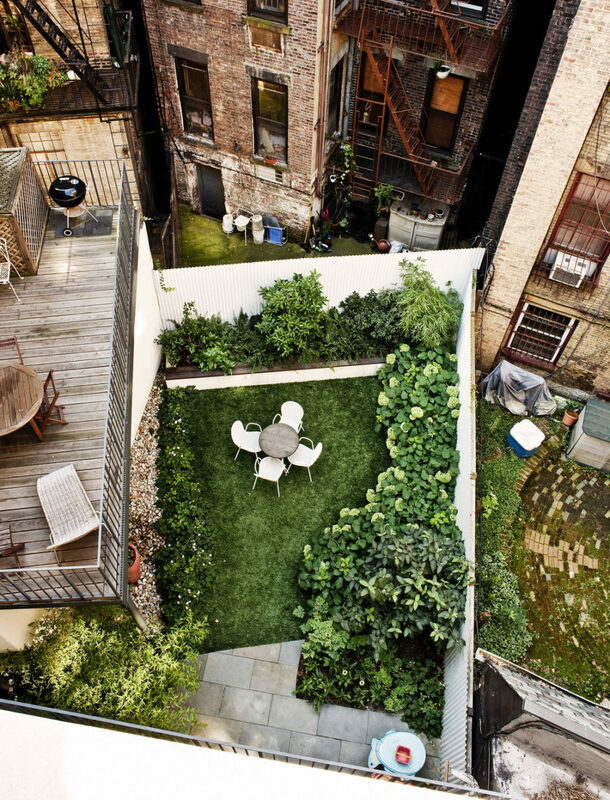 If you’re lucky enough to have a backyard you have a world of possibilities. You can turn it into an outdoor hideaway, a home office, or even your own resort. Backyard ideas are plentiful and all you have to do is choose from a pool of endless design solutions and put an idea into a plan. 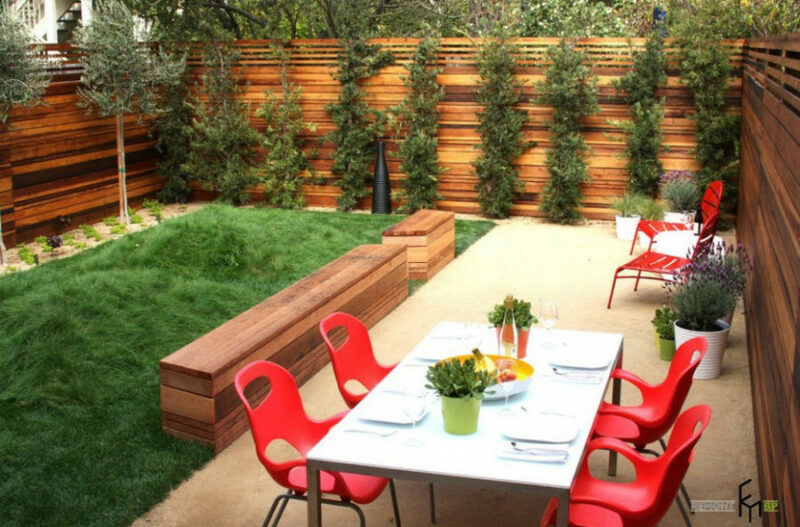 Here are the backyard ideas that will spruce up any existing design and will inspire many more incredible concepts. When it comes to outdoor design there are many styles to choose from. You can go with ultra modern minimal concrete surfaces and carefully manicured planter pots or a good old traditional aesthetic with lots of wooden furnishings. Japanese style is not only beautiful but it also requires little maintenance. 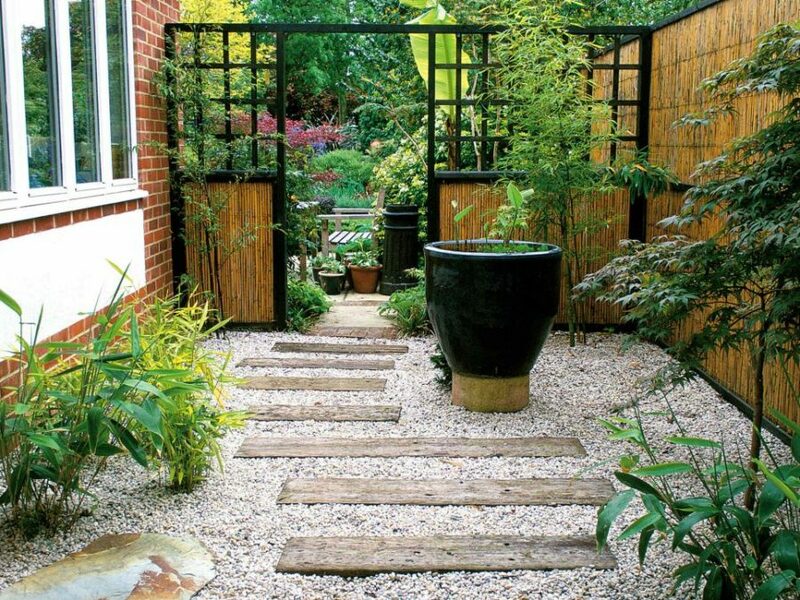 Bamboo fence and furniture add an exotic touch to this backyard. And gravel or white sand make for an attractive ground cover you don’t have to water or re-plant. One of the advantages of modern style is that it implies a lot of smooth surfaces, which also require little maintenance. It looks great in monochromatic colors that are easy to put together. And it calls for minimal furnishings as well as decorations. Greenery looks great in any style. 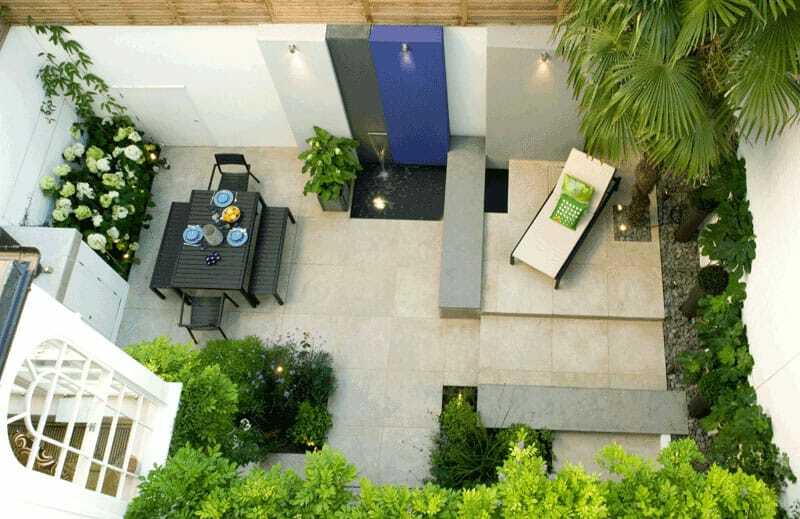 Here the green beds and potted trees outline the backyard bringing life to the cold monochromatic design. 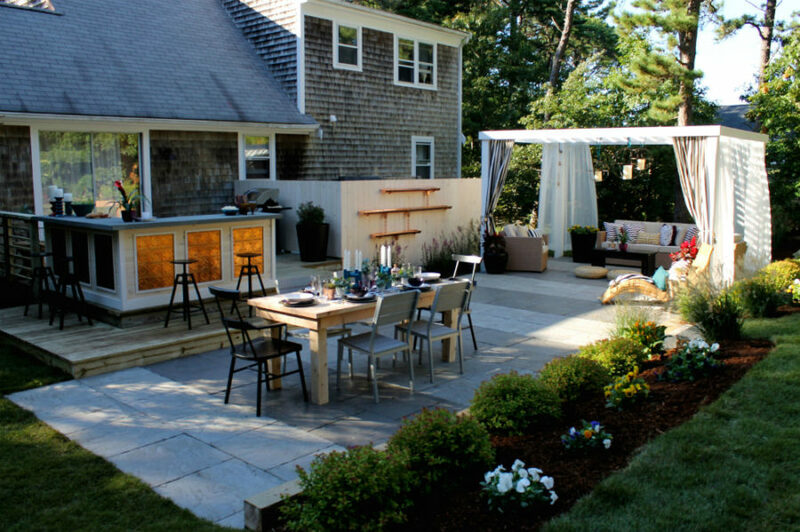 Just like with interiors mixing up styles in backyard design yields great results. You don’t have to stick to one aesthetic if you don’t want or can’t afford to. In our experience eclectic designs are the best anyway. 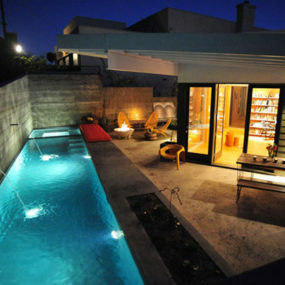 In this modern backyard we sense a faint hint of Oriental style in low roofs and statues. But the focus of the layout is a big modern coffee table that looks very unexpected and very impressive. Traditional style is always an option. It’s homely and inviting, and it’s easy to pull off. This house has a decorated kitchen counter and a few bar stools, wooden dining table, and a white pergola with a seating area and privacy curtains. That’s all you really need for receiving guests, cooking family dinner, and simply enjoying some fresh air. Even though it looks pretty conservative we suggest you to take note of that kitchen counter decor. 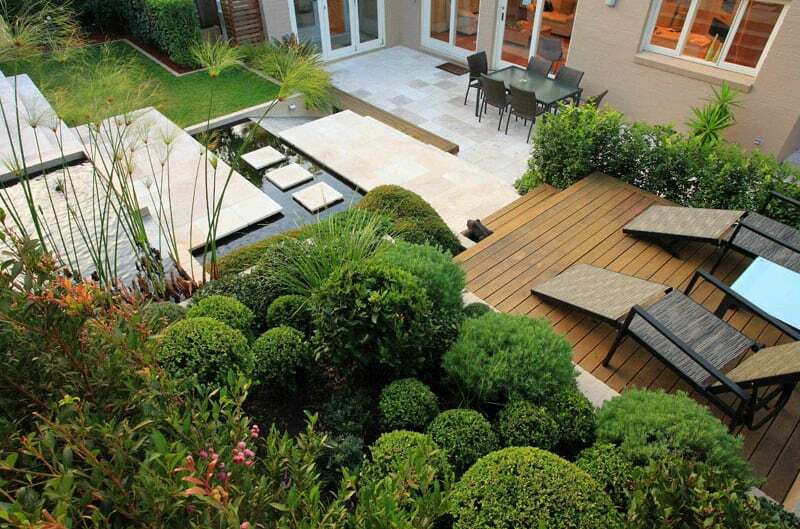 Another aspect of backyard design is, of course, layout. You don’t want it to be random and awkward. 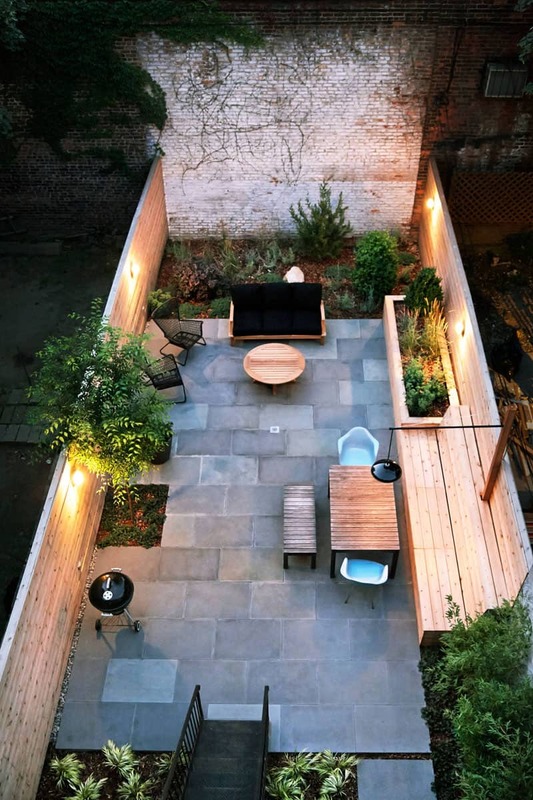 Foras Studio are professionals when it comes to small backyard layouts. The designers masterfully utilize available space to create landscapes that are impressive but low-maintenance. 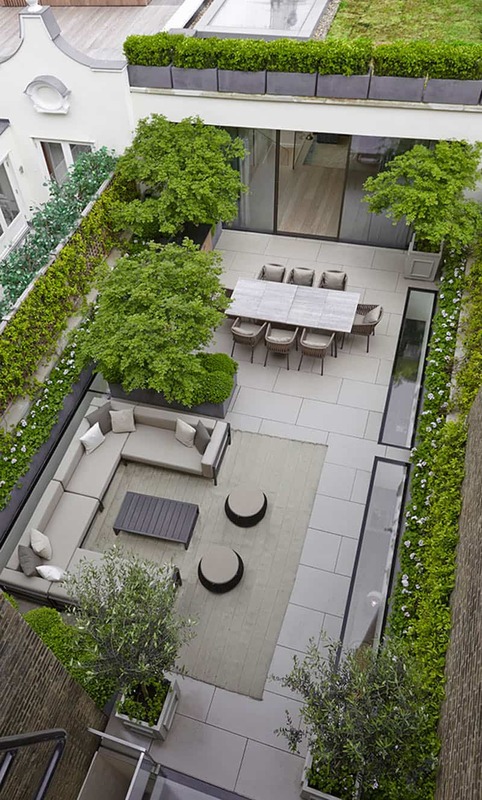 See how they divide floor space between a patio and a gravel-covered mini garden with box hedges and small bushes and trees. When designing your backyard it’s important to visualize its future layout, regardless of available space. This will allow you to avoid a lot of design mistakes and keep it functional. 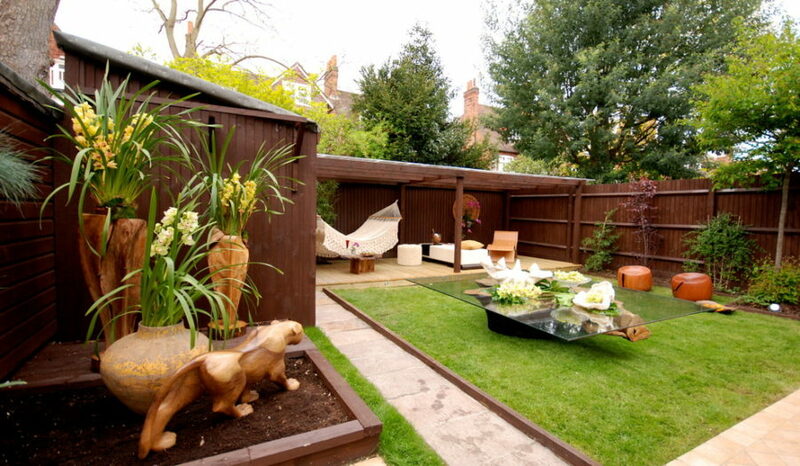 This backyard design by New Eco Landscape Design & Build shows a perfect layout for a small and narrow area. Green beds and soil patches are kept at the sides and out of the way. Seating areas are extremely functional and easy to access. 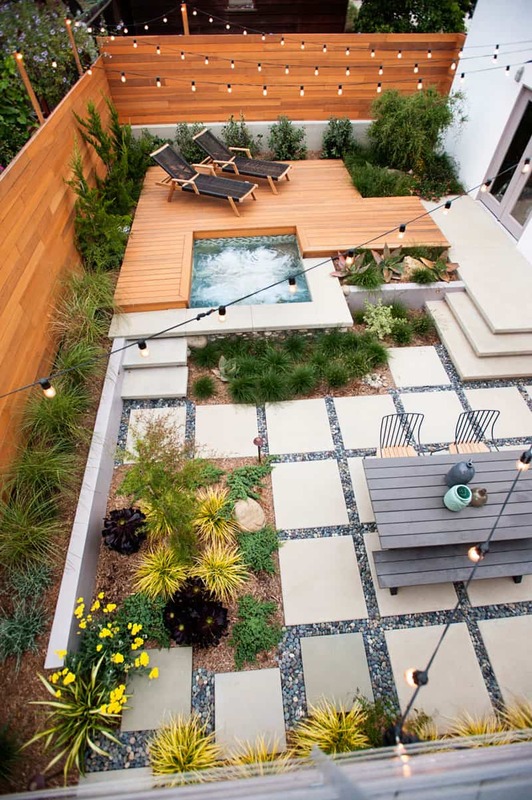 A backyard layout doesn’t have to be standard and boring. 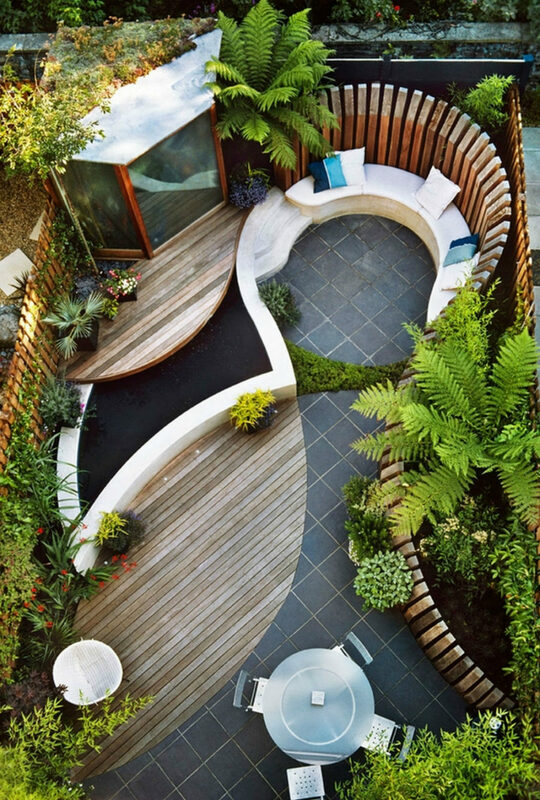 Take a look at this amazing design that uses curvy lines and different materials to zone out seating areas and greenery. 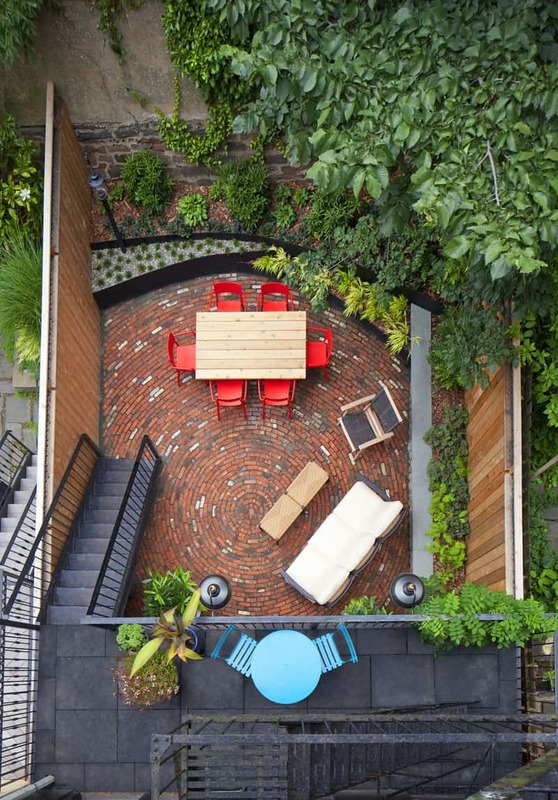 Both the dynamic shapes and contrasting finishes makes this the most unique backyard we’ve ever seen. 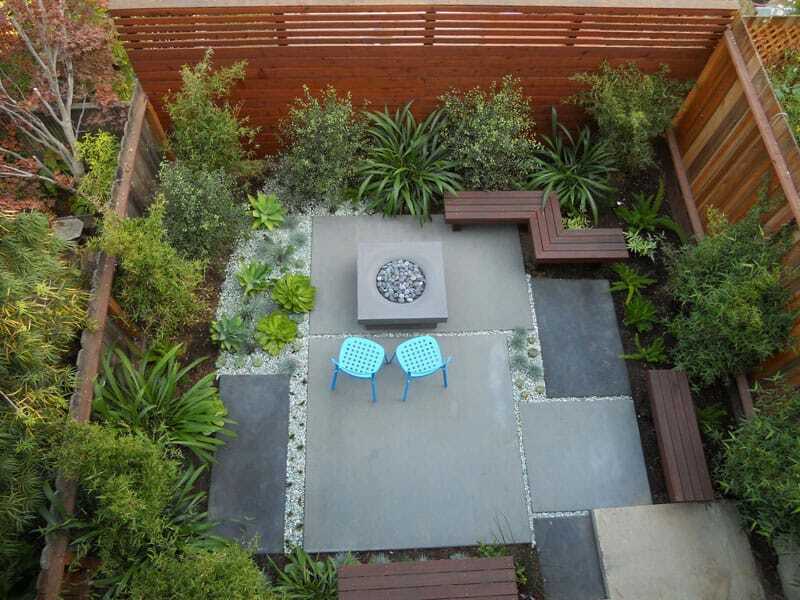 Dividing space between seating, cooking, and green areas is not easy especially in a small backyard, but it has to accommodate your needs and wants. And creative compromises are always possible. New Eco Landscape Design & Build divided this backyard into two parts, one of which is a serene green lawn canopied by two trees and another a cooking and dining area. 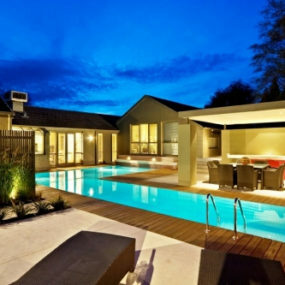 A perfect compromise for those who are looking to stretch their legs on the grass and also have some guests for a BBQ. Beside layout you have to choose the right materials for your design. Wood although cheap and warm doesn’t wear as well and requires regular refinishing to prevent rotting. But it looks beautiful against the rich green. Also. 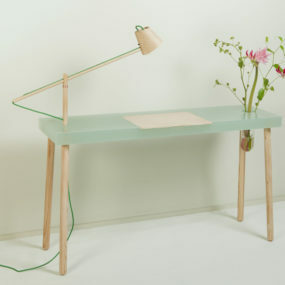 compared to other materials wood is still quite versatile and relatively cheap. While wood creates a welcoming atmosphere in the backyard, stone tiles make for a modern sleek look. They are perfect for flooring and decking and go well with wood. Contrasting materials can often bring an unparalleled dynamic to the outdoor design. So find the combinations that create the look you’re after. Combination of concrete and wood is perfect for a modern backyard. Concrete is easy to mold into anything from a wall to a fire pit. It’s stylish and wears pretty well. Both old and polished wood go well with it. The latter brings a more luxurious feel to the structure though. Your backyard would be half empty without a green landscape. It doesn’t have to be elaborate and complex. 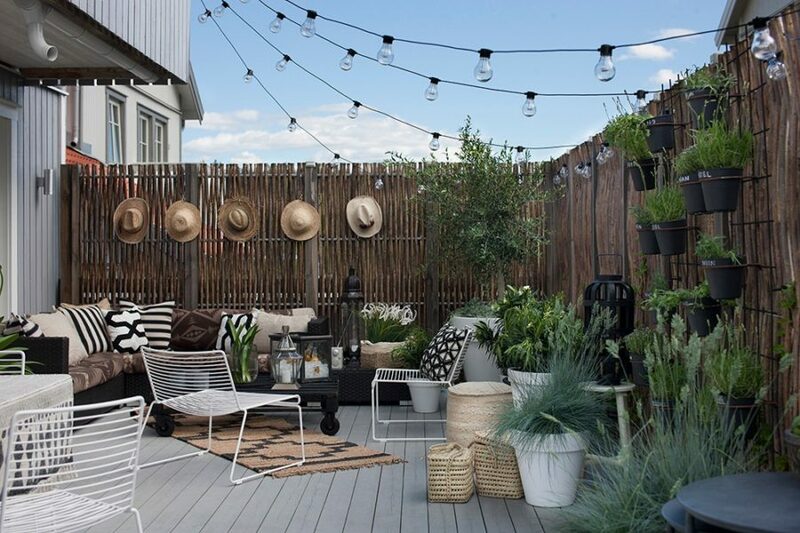 Eeven a simple landscape would bring a lot to your backyard in terms of decor. 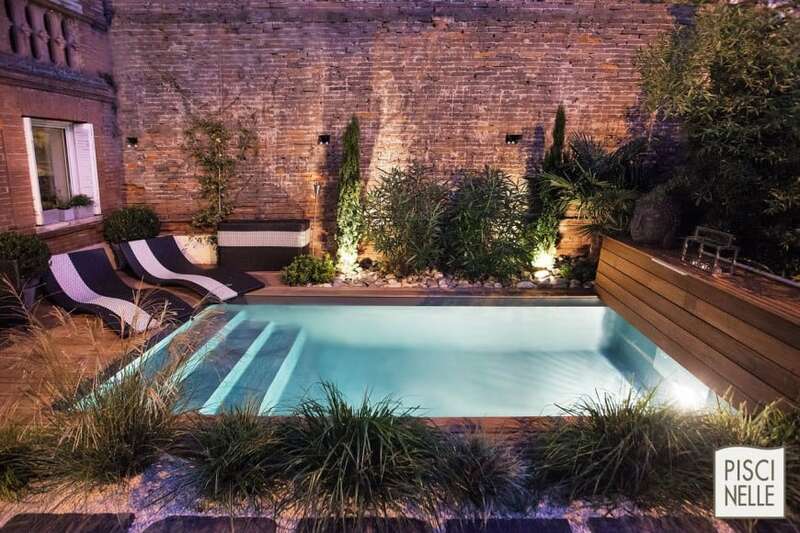 Mark Tessier designed this dynamic small backyard with mastery and taste. Small strips of grass and succulents make a beautiful modern alternative to a lawn. In addition the wood and concrete inclusions make this backyard look more interesting. 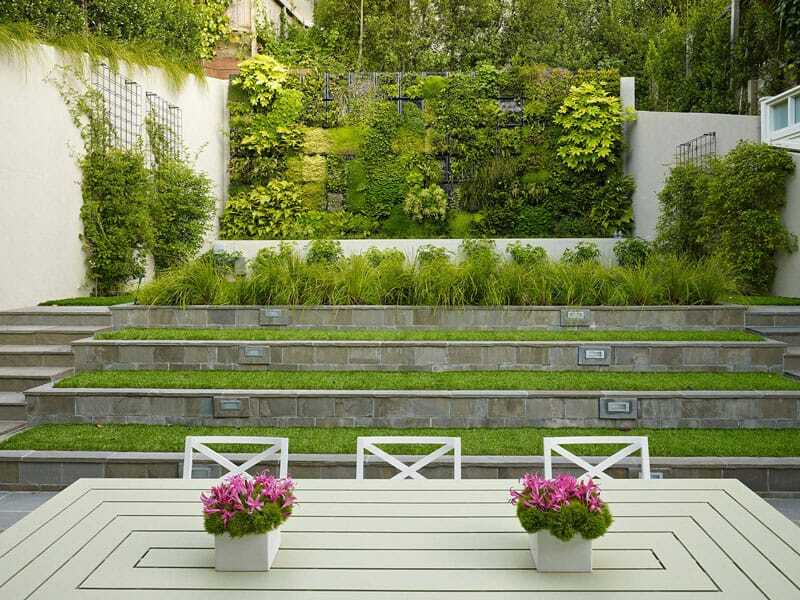 Landscape designers often go vertical to make things more interesting or maximize space. Introducing a mound or two is one way to inject some freshness into your backyard design. This is also a way out of constant lawn mowing. Just let those mounds sit in your backyard and grow out. You can use them as seats or back rests whenever you want to catch up on some reading or simply enjoy the outdoors. Eldridge London took another approach to vertical landscaping in their project creating multi-level wooden pots around it. 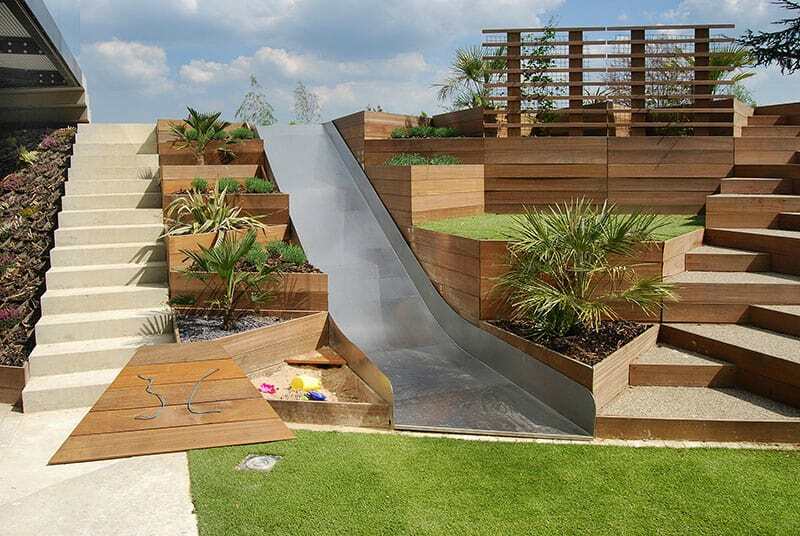 A steel slide with a small sand box at the end is a thoughtful addition for kids. This type of landscape maximizes space and allows even small areas have lots and lots of greenery. Remember, when you can’t spread wide, you have to go up. 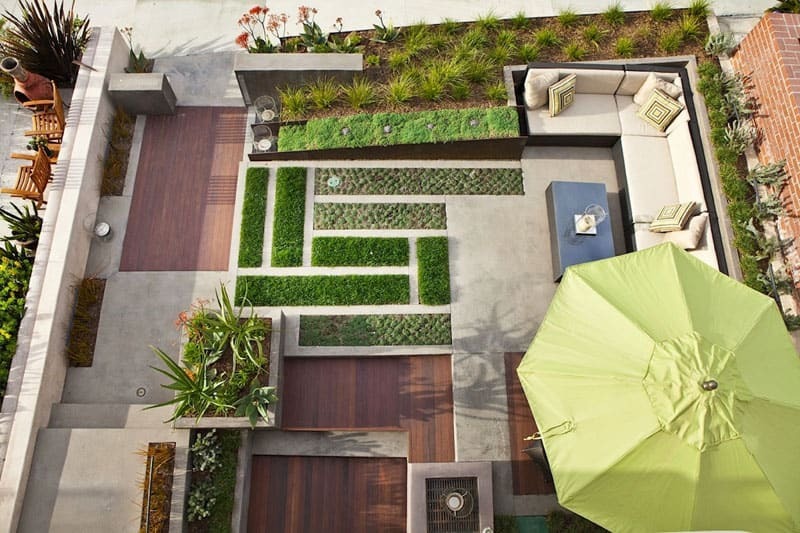 In this backyard the designers went with a green wall adding are a few grass-covered steps to the middle of the area. It creates quite a dramatic visual base for the vertical garden. At the sides trellises amplify greenery drowning out the white backyard walls. And only the white dining table makes this paradise a bit more earthly and functional. Multi-level backyard designs aren’t limited to small areas. You can simply take advantage of the amount of free space and create a maze of nooks and outdoor spaces where you can relax and your children can play. 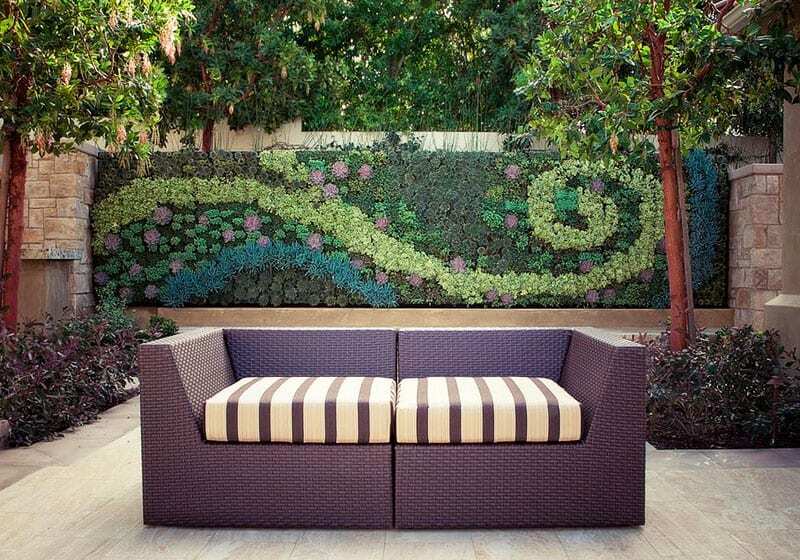 A cascading garden like the one designed by Fossey Arora Design is also simply beautiful. The crawling plants give it a ‘hanging garden’ look. And a complex structure provides with pockets of space for hiding and lounging. It’s also a good way to divide areas of various purposes. The lower level can serve as a garden and the mezzanine levels used as terraces and reading nooks. New Eco Landscape Design & Build decided to lay the dining area with red brick and designed the mezzanine in a contrasting black grey in this small backyard. 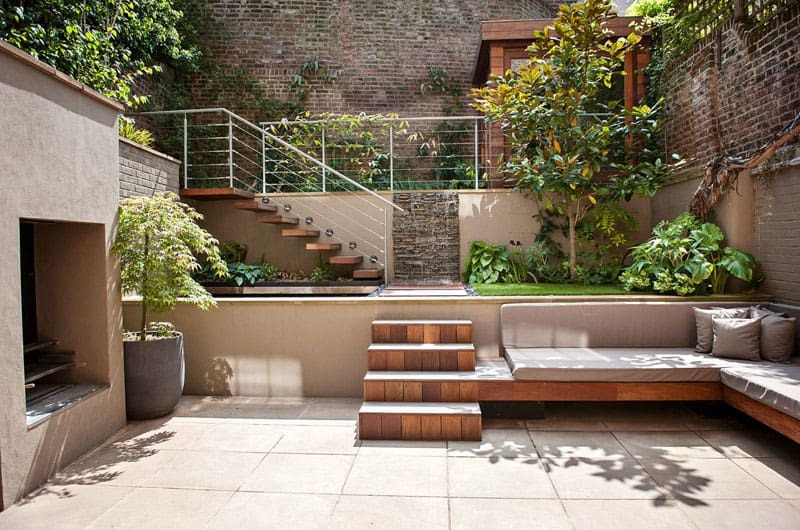 Though both areas are made for lounging they can be quickly converted into different zones. If you want to make the most of your land a compromise between a backyard and garden is more than possible. All you have to do is decide what you can live without. Since a garden requires space for more than a few plants, your outdoor kitchen and pool may have to compete for being the only feature there. 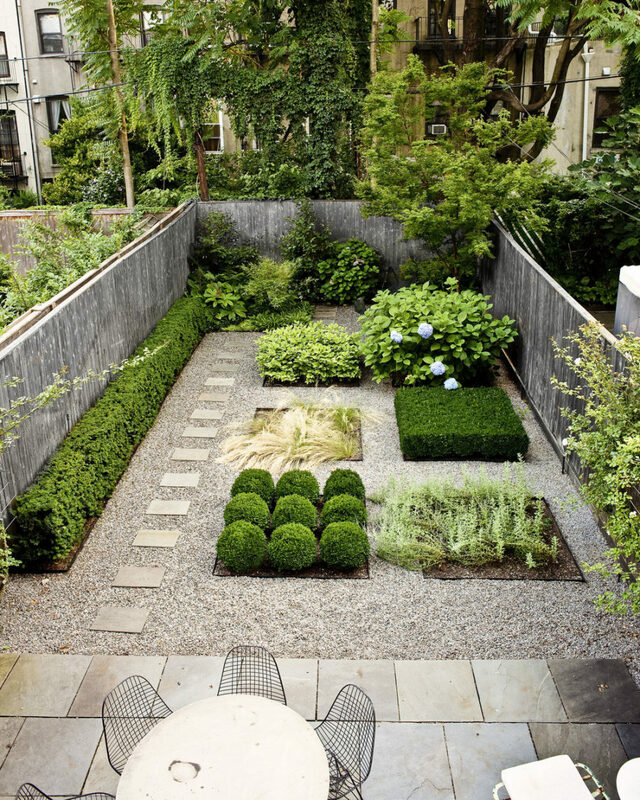 On the other hand, you can go with a minimal garden design and and try to fit them both. 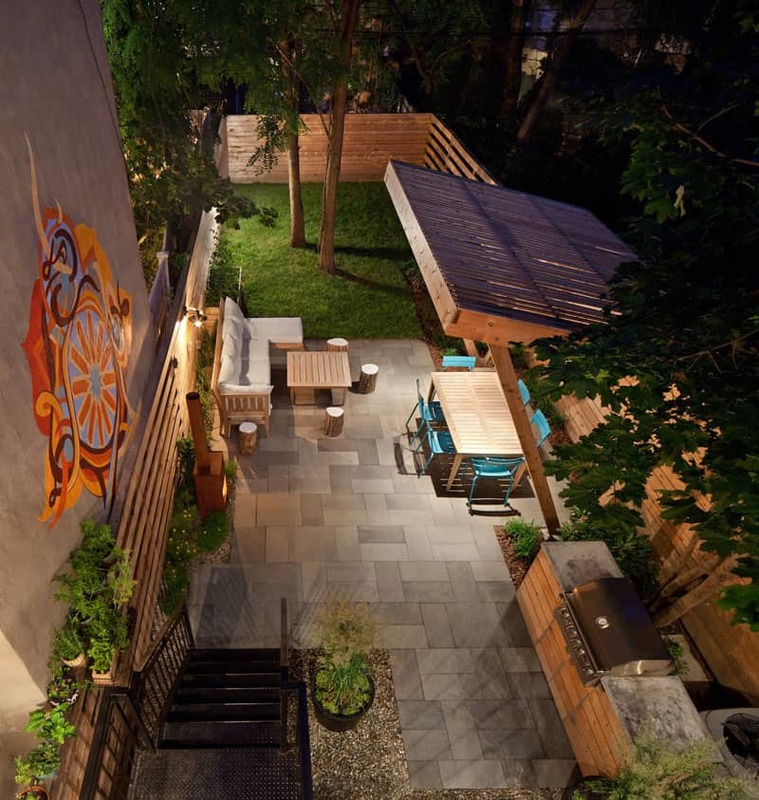 Another masterpiece from Foras Studio shows how you can combine a garden and a backyard. The green lawn is outlined with green hydrangea bushes and other smaller plants growing separately in a wooden container. Thankfully there is a loft terrace with a BBQ and a dining area just above the garden. But even without it this design would be sufficient enough for receiving guests and dine under the sky. A garden doesn’t have to be big to be impressive. 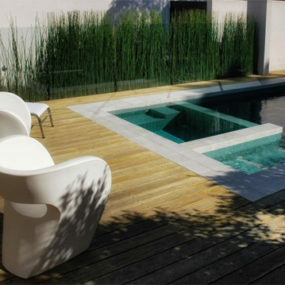 Design Line Builds’ modern waterless garden encased in a white elevated platform makes a case for minimalism. Surrounded with a wooden fence the area is divided by levels. The upper one holds soil for planting and growing whereas the lower level is covered with stone tiles whose seams are planted with moss. If you’re determined to make this marriage between a backyard and a garden work, planter pots can help where there is no soil in sight. Arranging a few differently sized pots with your favorite plants and trees can create an illusion of a lush garden. 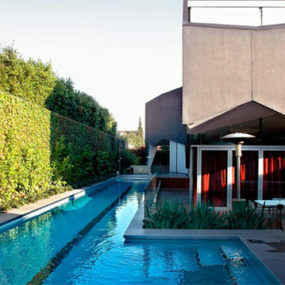 When it comes to backyard design many opt for a water feature such as a swimming pool. It’s beautiful, it’s functional, what’s not to love? Sure, there are cost and maintenance issues, but when did that ever stop anyone? 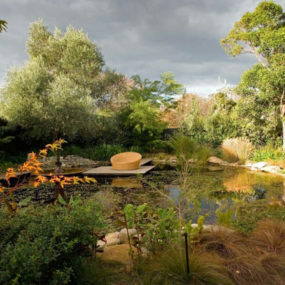 A swimpond is a natural swimming pool that doubles as a pond. It’s convenient when you want to combine the aesthetic of one and functionality of the other. It can also be the other way around. 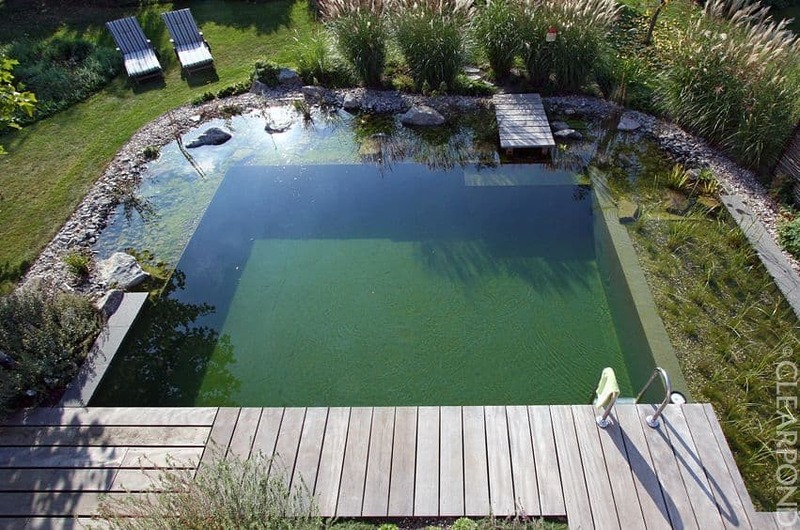 You can surround a regular pool with plants and rocks to create that natural pond look without the usual attributes like green water and plant filter system. This is a perfect example of how to do it. A plunge pool deck offers convenience and comfort while the green inclusions bring a piece of nature to the look. As you can see small backyards aren’t immune to swimming pools. In fact, plunge pools are quite popular because of their low-maintenance requirements. They consume less water, take less time to clean, and aren’t as costly to build in the first place yet give you the same refreshing feeling as regular pools. If your backyard is long and narrow you’re in luck. 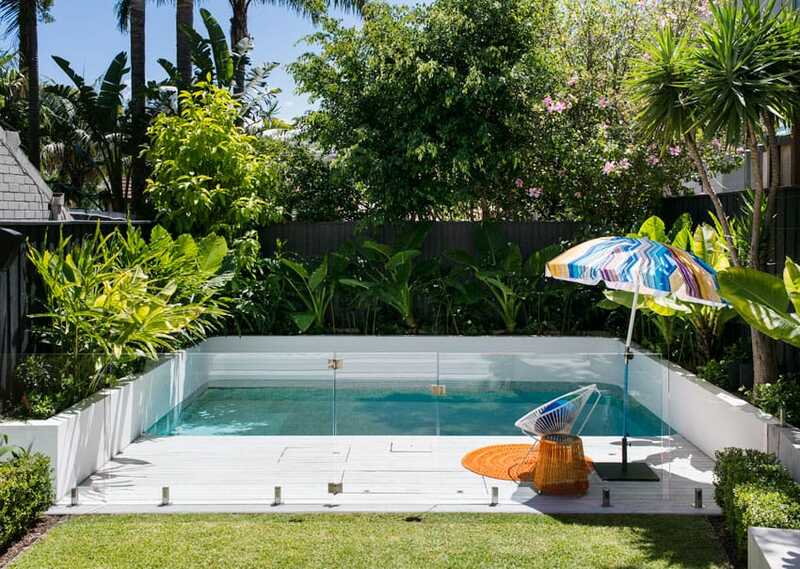 A narrow lap pool doesn’t just provide you with space to work out but also looks luxurious especially when landscaped well. 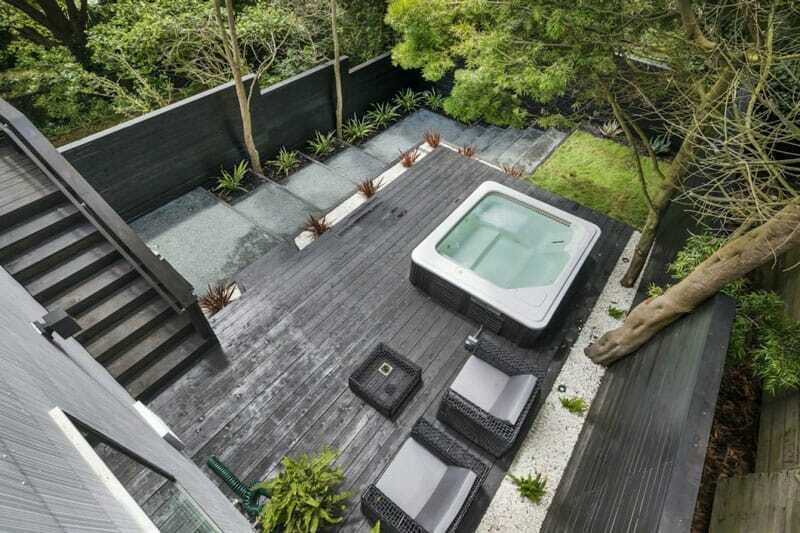 Can there be a better example for it than a Bali villa backyard lush with greenery? Take note of a built-in deck hidden in a green oasis and irregularly shaped stepping stones on a peculiar curly ground cover. 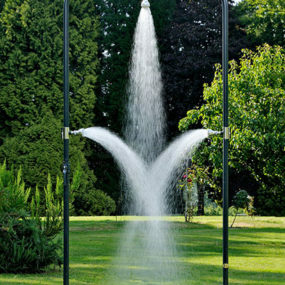 When you don’t have the budget or patience for a pool, you can always go with an alternative water feature like a fountain or a mini pond sans fish or plants. 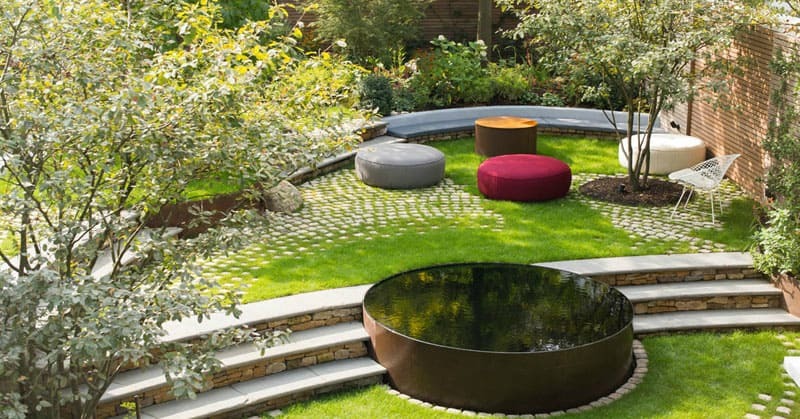 Bartholomew Landscaping went for a simple circular pool for their Gilston Road Chelsea landscape project. But it wouldn’t look the same if they didn’t build it right into the steps dividing them and bringing attention to the unusual accent. Seating design is one of the biggest parts of backyard decor. 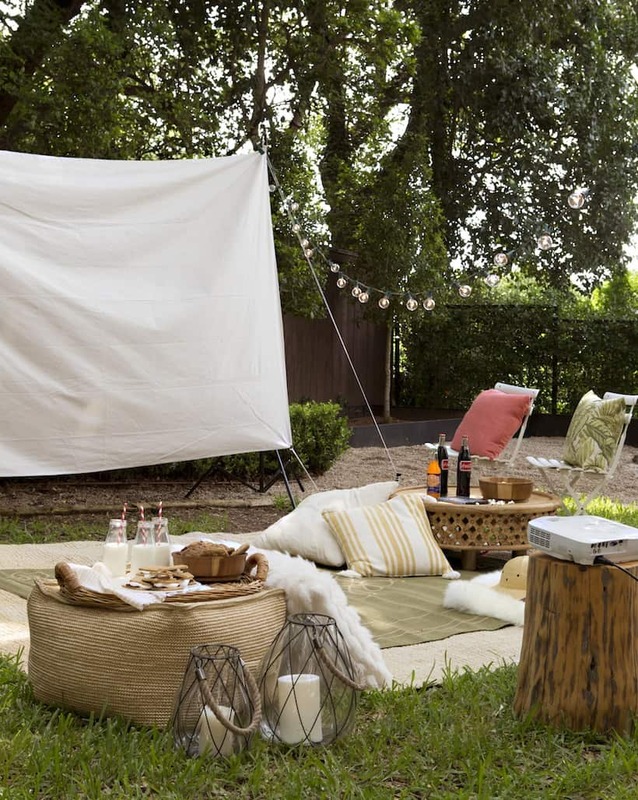 We’ve seen hundreds of backyard seating ideas and this, by far, is the best one. 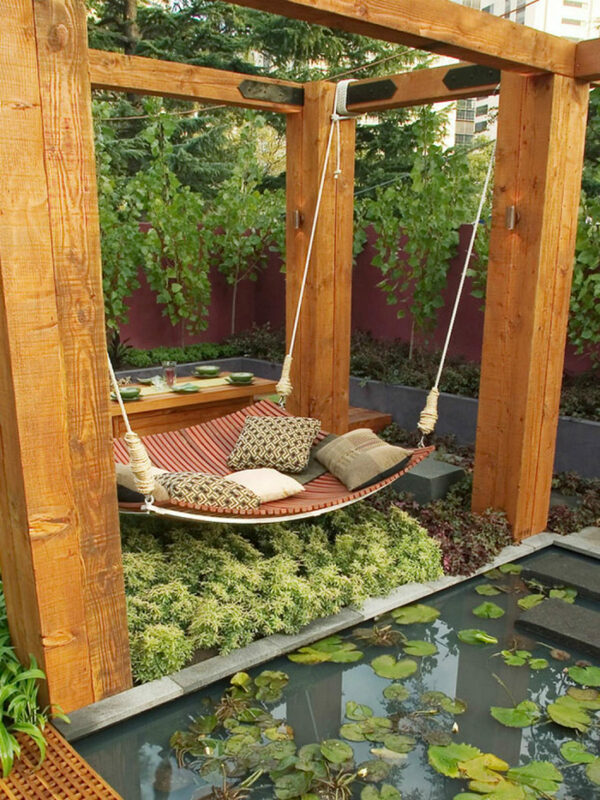 Combining properties of a hammock and a daybed it looks relaxing and very unusual. It also gives ground space to the plants underneath it. And they in turn create an illusion of a soft live cushion that just like a cloud beckons to sit on it. If there is no water features or other impressive design elements you can always try a feature wall. It instantly creates a focus in the area and adds character to the design. This one doubles as a vertical garden. The colorful succulents create a beautiful picture that wouldn’t impress as much if it was drawn on. Sometimes something as simple as lighting can transform your entire design. String lights are popular in both interior and outdoor decor for this very reason. They make everything look better. 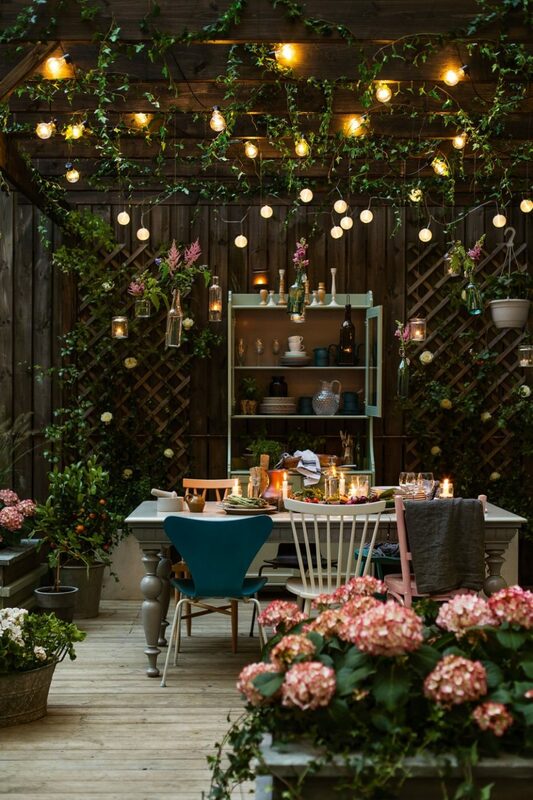 In case of this gorgeous backyard by Karlsson Magnus string lights only emphasize its beautiful trellises and vintage allure, but without them it probably wouldn’t look the same. Let’s focus a bit on the seating element. If you can turn this mundane thing into something special you won’t need anything else. It will be your feature, your decor, and the backyard itself. 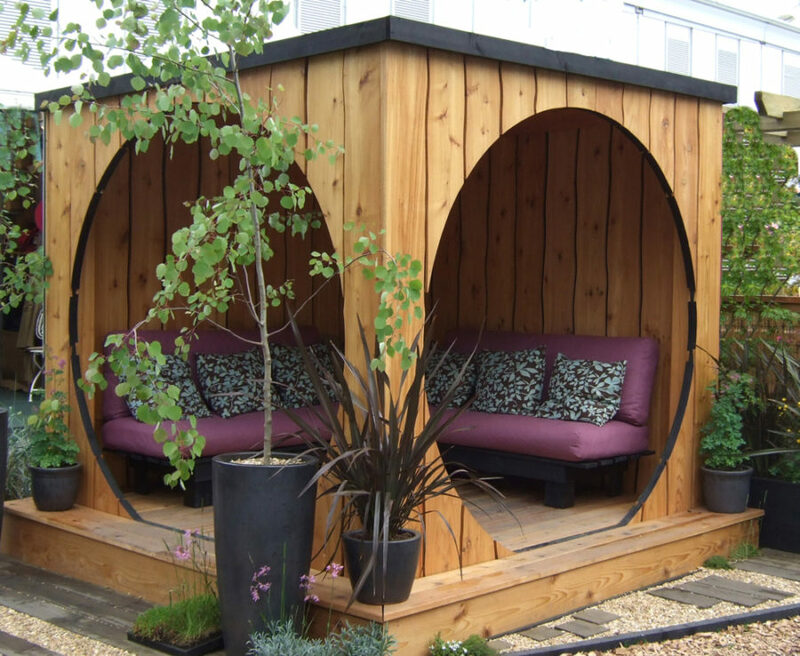 For instance, this garden pod by Chris Nangle is that special. It attracts all attention and beckons to sit back and enjoy the great outdoors from inside its protective walls. A hammock in the backyard already sounds like a cliche, but not when we’re talking about unusual designs. Trinity Hammocks don’t just look different they also allow a few people to relax at once. 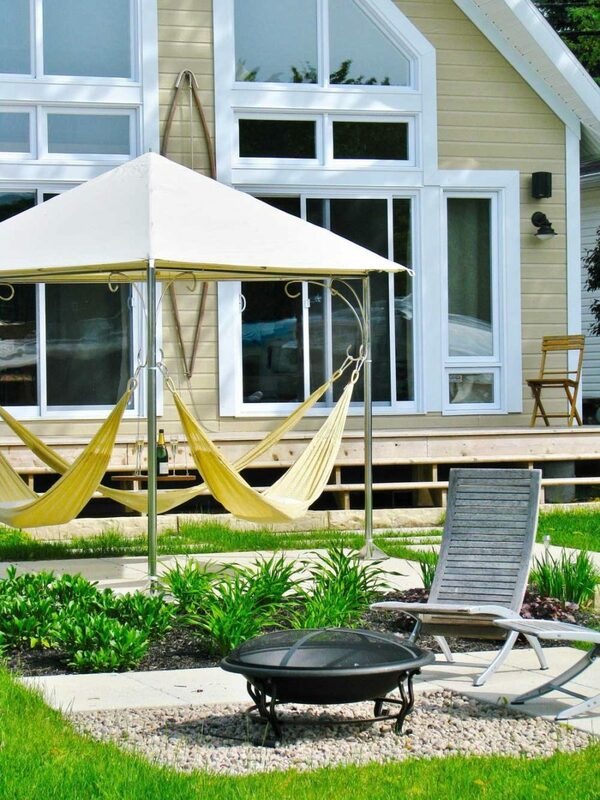 Hassle-free structure is another advantage of a modern hammock that can be placed anywhere in the backyard regardless of trees and supporting posts. 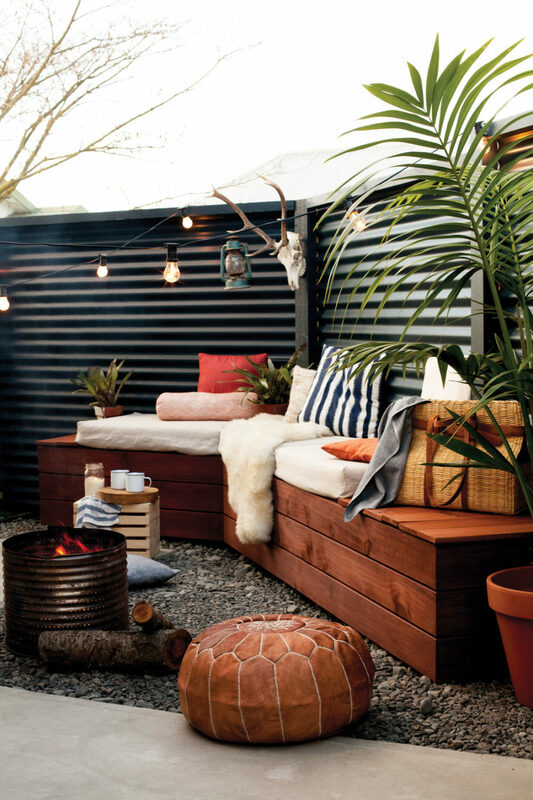 Daybeds are incredibly popular in modern backyards, but the high-end pieces can break the bank. Here is where a DIY-er in you might start searching for inspiration. 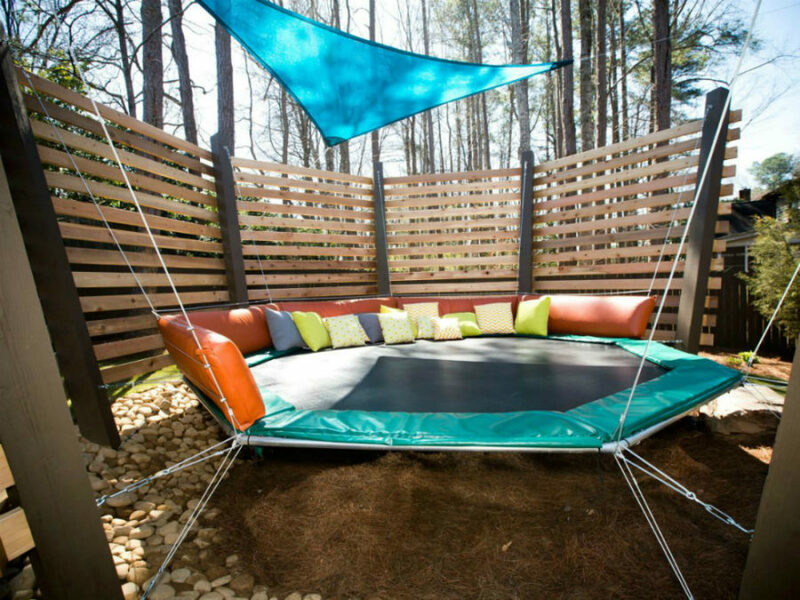 If you have an old unused trampoline lying in the garage, it’s time to get busy with a suspended trampoline bed. Even if your seating is simple in structure and design you can always count on decor to create a striking look like this arrangement by The Fresh Exchange. 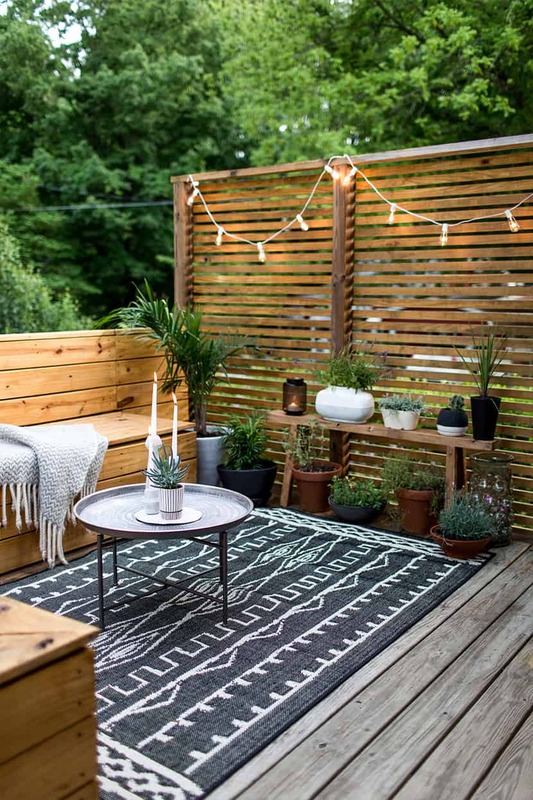 A simple wooden bench is complemented with a privacy screen that becomes a backdrop for plants and a support for string lights. The patterned rug and a tray coffee table make unusual accents that attract attention and dress up the natural wood. 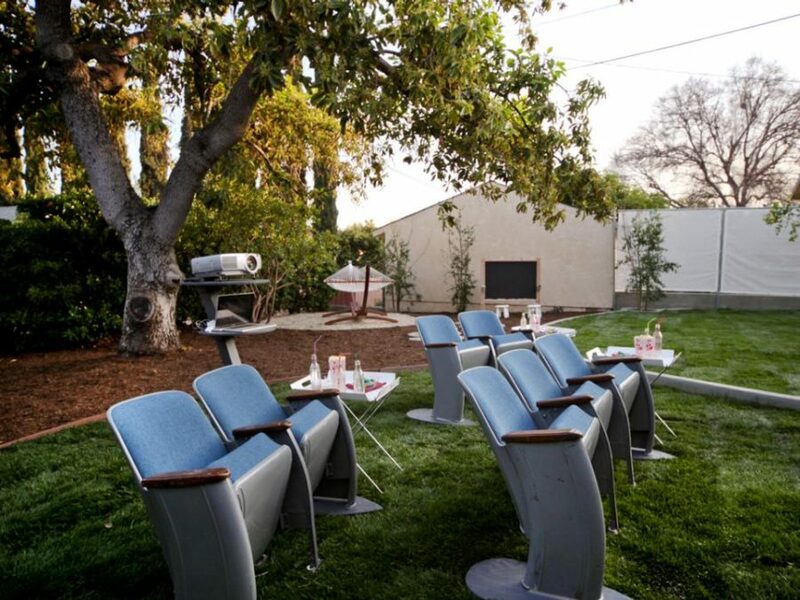 Some people like to use their backyards to create an ultimate playground for their kids and others outfit them for their favorite activities, one of which is watching movies. All you need for an ultimate home cinema session is a projector, a screen, and a few old theater chairs. Oh, and don’t forget the popcorn! A white canvas should do the job if you’re looking for a screen, although a specialized screen will probably provide with a better picture quality. And if you can’t get your hands on those theater seats, there’s no rule that says you can’t sit on the floor leaning on a pile of cushions. 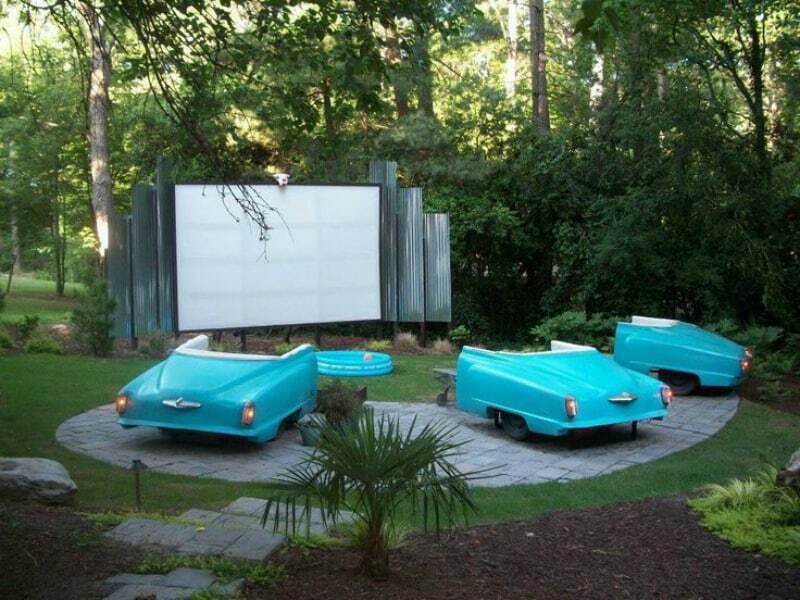 If you ever dreamt of owning a car cinema you might not be that far from realizing it. A few old car chairs like these would probably make the bulk of the budget. You’d probably also have to have enough space for such big seats. Another idea to steal from this backyard is a screen flanked by corrugated metal. What a look! 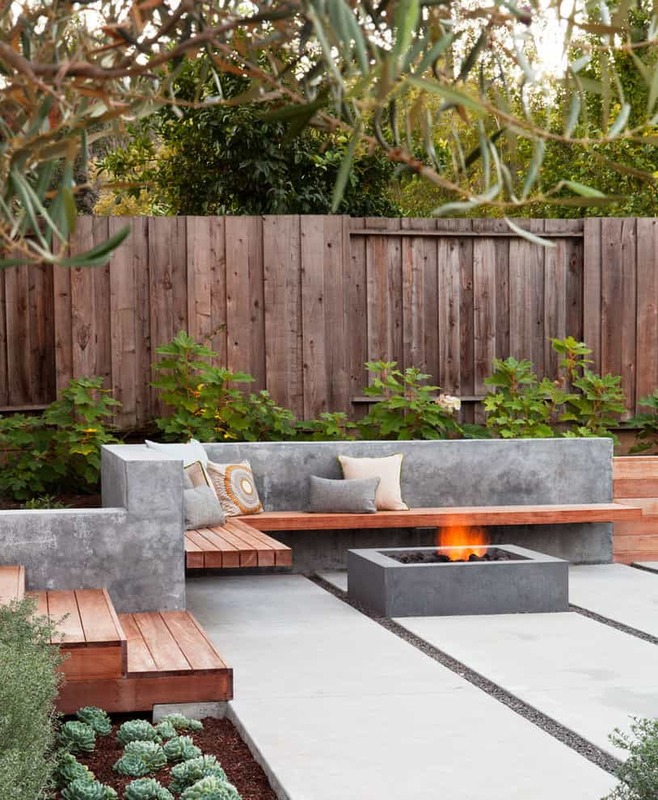 Small backyards are prevalent and they all require unique design solutions that would satisfy their owners’ needs and desires. Take a look at this sophisticated project. Its soft neutral color scheme is accented with graphite grey and royal blue, not to mention the bright green. And even though there’s barely any space it looks airy and not at all cramped. Backyard by Falling Waters Landscape, Inc.
You can see Falling Waters Landscape, Inc. were scrupulous in their approach to this small backyard. There’s everything a modern dweller requires and then some. The space is divided between a wooden terrace with a built-in hot tub surrounded with vegetation and a dining table. Every inch of free space is also planted with ornamental grasses and modest blooms. 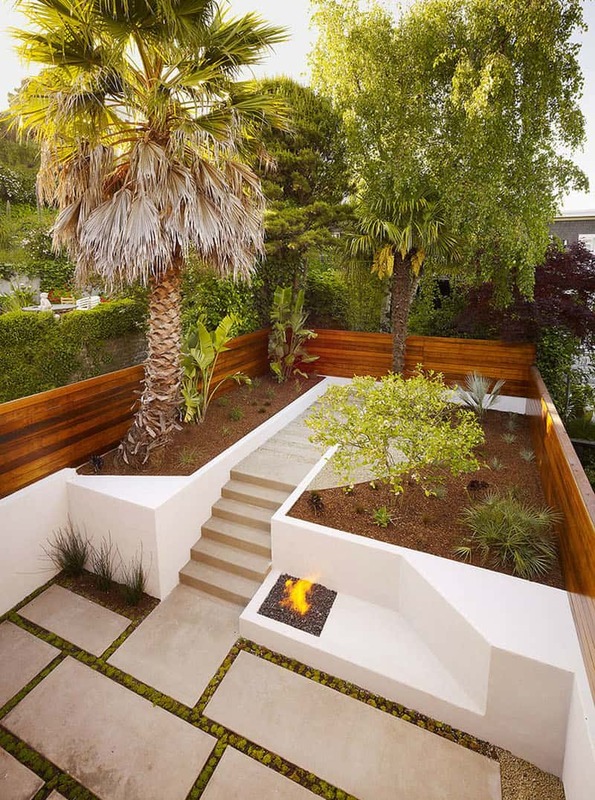 Growsgreen Landscape Design decided to focus on the natural elements like plants and fire. The latter comes contained in a square fire pit. 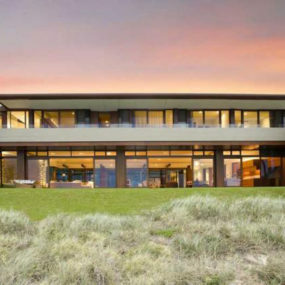 Although the area is surrounded with growers, it seems like a low-maintenance design just right for a modern homeowner. In tiny backyard all you can do is decorate. Create a stylish seating area using accent throw pillows and a small stool or pouf that can double as a coffee table. 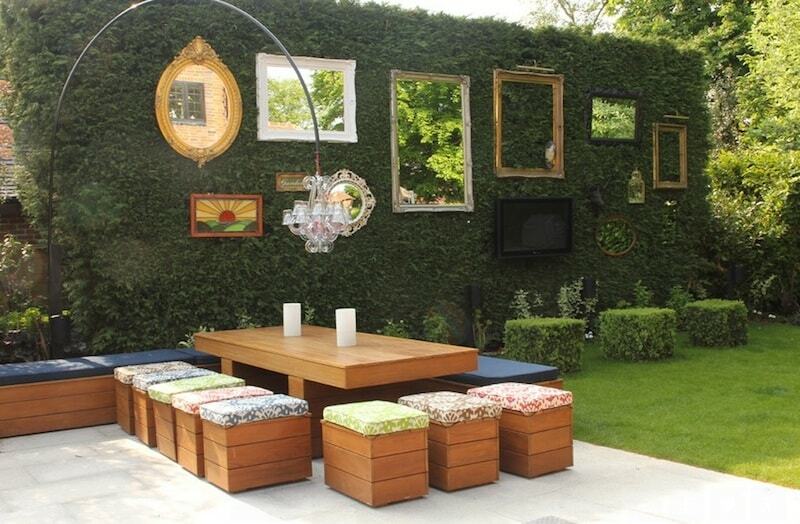 Just try to find the right balance between furnishings and decorations not to overwhelm your small backyard. Backyard ideas don’t end here. The possibilities are truly endless. If you have no budget for it, there’s always another DIY tutorial that can give you a backyard of your dreams for less than $500. And if you want something truly unique there are tons of professionals who can turn your backyard into a paradise on Earth.